I haven't blogged about dark matter for almost 2 months, and already there is a pile of long overdue dark news. This post is about a couple of recent unpublished results that mean trouble for theorists trying interpret the DAMA signal. 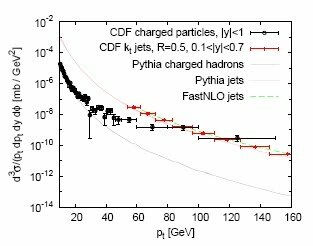 Weak scale inelastic dark matter. In this scenario a dark matter particle with mass of order 100 GeV scatters to an excited state with order 100 keV mass splitting. The inelastic scenario favors heavy targets (such as DAMA's iodine, A = 127), and enhances the modulation rate (only dark matter particles from the tail of the velocity distribution can scatter, so that small changes of Earth velocity can significantly change the available phase space). Light (5-10 GeV) elastic dark matter. 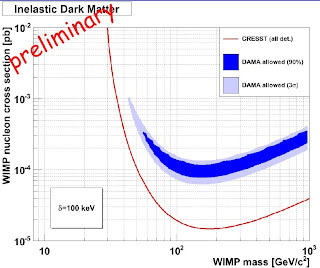 This scenario favors very light targets (such as DAMA's sodium, A = 23) and experiments with low detection thresholds (such as DAMA's 2 keV), as light dark matter particles cannot give a large push to heavier target nuclei. A few weeks ago, the former possibility was blasted by CRESST - yet another dark matter experiment under Gran Sasso mountain. 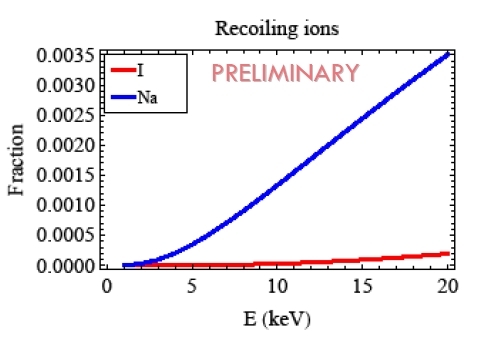 CRESST uses CaWO4 crystals as the target, and detects scintillation and phonons to discriminate nuclear recoils (expected from dark matter particle) from alpha, beta, and gamma recoils (induced by ubiquitous backgrounds). The presence of tungsten (A = 184) in their crystal makes it very sensitive to the inelastic scenario. But the latest preliminary results presented at the Wonder2010 conference do not show a clear signal. Although CRESST has a handful of (most likely) background events in the signal band, the number of hits is much smaller than that predicted by the inelastic scenario consistent with the DAMA signal. The collaboration claims that the DAMA region is excluded by more than 3 sigma. This should be treated with a grain of sodium chloride as the CRESST data are not yet public and the assumptions that enter the derivation of the limits are not clearly spelled out in the slides. But most likely, the inelastic window is getting closed. The explanation of DAMA via a 5-10 GeV dark matter particle is also facing problems. 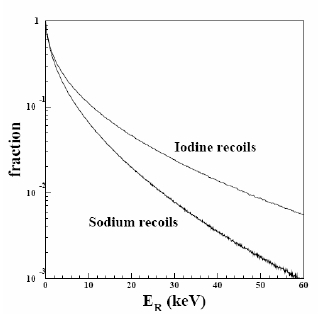 The (marginal) consistency of this scenario with null results from other experiments hinges on the so-called channeling effect in sodium-iodide crystals. 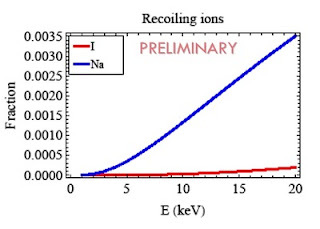 Normally, an incoming particle recoiling against the crystal nuclei deposits most of the recoil energy in the form of lattice excitations (not observed by DAMA) while only a small fraction goes into scintillation (observed by DAMA). Channeling refers to the situation when an incoming particle gets caught along the symmetry plane of the crystal undergoing a series of small-angle scatterings and losing most of its energy via scintillation. Since a fraction of less energetic recoils can be detected thanks to channeling, the detection threshold of the experiment is effectively lowered. 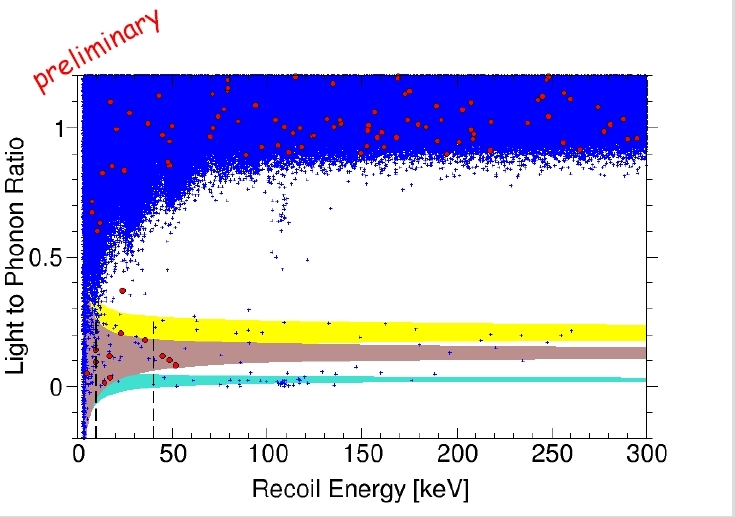 The effect is especially important for light dark matter because in this case the recoil spectrum is very sharply peaked toward lower energies. The channeling probability reported by DAMA is very large, of order 30 percent in the interesting range of recoil energies, which would greatly increase their sensitivity to light dark matter. Given its importance you may expect that channeling in sodium-iodide crystals has been carefully studied by the DAMA collaboration. However, DAMA would not be herself if she dwelled on such trivialities. Instead the collaboration estimated the channeling probability using monte carlo simulations based on a theoretical model not applicable for the actual problem. Recently I came across slides from the Snowpac2010 workshop describing an independent attempt to estimate the channeling fraction using more reliable theoretical assumptions. The preliminary results contradict the conclusion of the DAMA collaboration: the channeling probability in sodium-iodine is negligible. If this is right, simple models of light dark matter cannot consistently explain the DAMA oscillation results. The LHC just started colliding protons at 7 TeV, marking the symbolic beginning of a new decade in particle physics. A good moment to complete the summary of the past one. Some time ago I made a list of most important particle-related experimental results. Time for theory. What significant developments took place in particle theory during the noughties? Well...none, in the first approximation. The past decade has been marked by inertia and intellectual masturbation. The last truly novel ideas, like AdS/CFT, Randall-Sundrum, or ADD, were all born back in the 90s. No surprise that the list of 50 top cited articles last year contains only 3 particle theory papers written in the 00s, none of which in a prominent position. Nevertheless, our understanding of particle theory has progressed, somewhat. Here is my subjective, biased, and utterly unfair summary of the most interesting developments. Warped extra dimensions a-la Randall-Sundrum have dominated new physics model building. Perhaps the most interesting aspect of that industry is a qualitative analogy between five-dimensional warped models and purely four-dimensional strongly coupled models. This of course is not completely unexpected given the AdS/CFT conjecture. Nonetheless it is interesting that the correspondence extends to more down-to-Earth and phenomenologically relevant examples, even if in a vulgarized form. And so, 5D Higgsless theories are large N technicolor models in disguise, 5D gravity in a black hole background captures some aspects of heavy ion physics, etc. Even low-energy QCD can, to a certain extent, be modeled this way, and some quantitative predictions for the parameters of the effective chiral lagrangian can be derived. The bulk of particle theory is driven by the fact that the Higgs boson mass in the standard model receives large, quadratically divergent corrections at the quantum level. The common expectation, or maybe just wishful thinking, is that new symmetries and new particles appear at the TeV scale to fix that problem. The best known example - supersymmetry - is based on a boson-fermion interplay, for example, quantum corrections from the top quark are canceled by its scalar partners called stops. This is however not the only possibility, and the cancellations can occur between the same-statistics particles, for example top quark contributions can be canceled by another heavy colored fermion. This option has been known since 70s, but only during the last decade it was systematically understood and classified in the framework of little Higgs and gauge-Higgs unification theories. The end results is rather depressing though: all models we have constructed so far are just as good, or rather just as bad, as supersymmetry. Theorists working on QCD have always been looked down upon by smartasses building new fancy models of the universe. Yet in the past and in the coming decade hadron colliders are the sad reality, and an input from QCD theory is necessary to isolate new physics from mundane background processes. Definitely, tons of good work in that direction has been done. At the most basic level, we have seen heroic computations of higher-order corrections to SM processes like W+jets, Z+jets or ttbar+jets, and so on, without which life at the LHC would be much harder. At a more sophisticated level, new jet algorithms better suited for hadron colliders have been developed, and new ways to search for new physics using jet substructure have been proposed. One should also mention the progress in theoretical handling of QCD, for example the soft-collinear effective theory. Models of dark matter are more numerous than stars in the sky, so why bother about another thousand spawned during the last decade? However, some recent proposals are important because they changed the way we search for dark matter. On one hand, models based on KK parity and T-parity prompted us to explore new collider signatures. Even more important was the impact on direct detection experiments. Not so long ago experimenters, brainwashed by MSSM preachers, searched only for spin-independent (coupled to nucleus' mass) or spin-dependent (coupled to nucleus' spin) elastic WIMP scattering. Experimental set-ups as well as data analyses were tailored for these 2 possibilities to the point that less standard dark matter signals would simply be discarded as background. This embarassing situation has been greatly improving in recent years. Thanks in part to inelastic dark matter models, or the recent offensive of light GeV scale elastic dark matter models, experimental analyses are becoming more flexible and developing alternative experimental techniques is being encouraged. 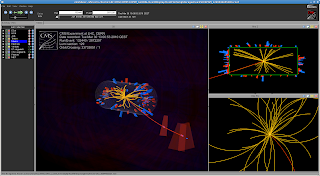 April Fools'10: Supersymmetry Discovered at the LHC?! The floor has hardly been swept after celebrations of the first LHC 7 TeV collisions, and it seems that very soon champagne corks will pop again. That could well be rivers of champagne. I've just been informed that a couple of events captured during the first day of high-energy running contain unmistakable signatures of a particle predicted by supersymmetric theories!!! 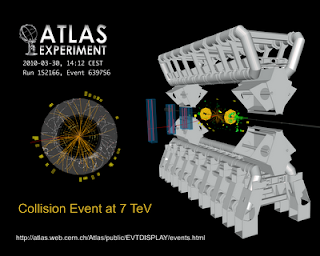 The first of these events, reproduced on the right, has been observed in the ATLAS detector. An analysis of the event uncovered that the track marked in red corresponds a charged particle with the mass of approximately 800 GeV!!! This is a new, previously unknown particle, that can only be produced in very high energy collisions such as the ones now available at the LHC. 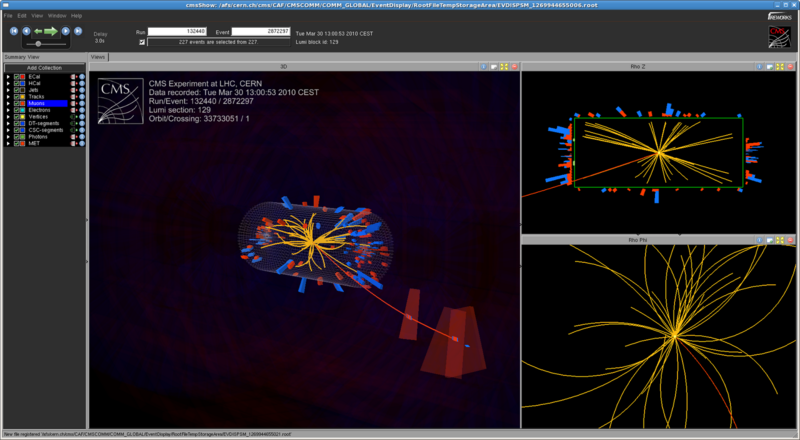 This is absolutely amazing, it's the greatest day in the history of particle physics. We thought that reaching discoveries would be a long and painful process, but Nature has been extremely kind to us. 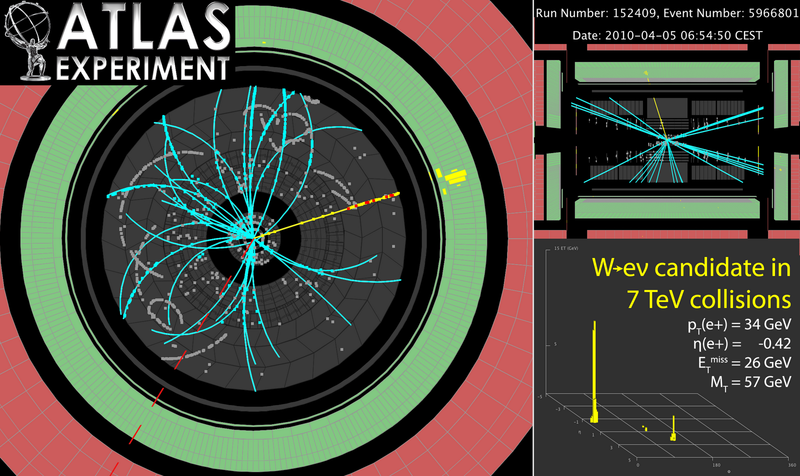 The other striking event comes from the CMS detector. Ironically, it has already been shown at the public presentation on March 30. 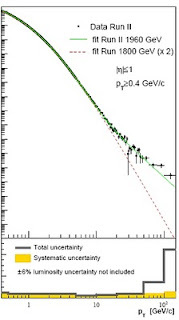 At that time, however, the particle marked in red has been mistaken for an ordinary muon due to a glitch in the detector electronics that lead to an incorrect measurement of the particle momentum. 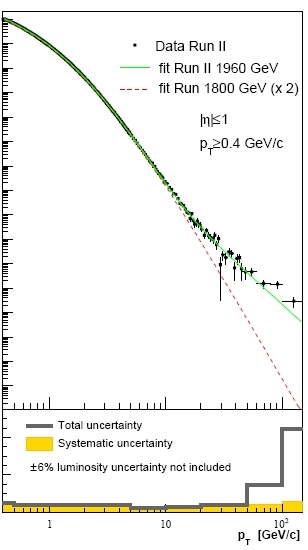 But a reanalysis of the event lead to a conclusion that this is an 800 GeV particle, definitely not a muon!!! Most likely this particle is of the same kind as the one seen by ATLAS, which means we have an independent confirmation of the discovery. The most plausible theoretical interpretation is that ATLAS and CMS have observed a chargino: a supersymmetric partner of the standard model W and Higgs bosons. A very interesting conclusion that can be drawn from these two events is that the chargino is quasi stable: rather than decaying immediately, it lives long enough to traverse the entire detector. Such long-lived charginos are predicted by a version supersymmetric theories known as gauge mediation. In that scenario, the chargino decays to a W boson and a gravitino (the supersymmetric partner of the graviton) who is the lightest supersymmetric particle. The decay proceeds very slowly because the gravitino, much as the graviton, has a tiny coupling to ordinary matter. A few points are still unclear from the theoretical point of view. For example, we would expect supersymmetric particles to be produced in pairs, whereas both experiments observed a single chargino. It is possible that the other chargino might have been lost in a crack of the detector, or charginos are produced together with a different supersymmetric particle species that decays immediately. This conundrum should be resolved as soon as a larger event sample is acquired. 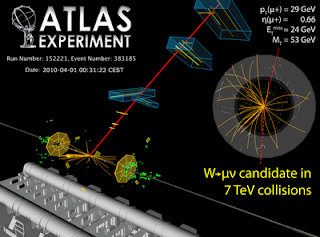 The ATLAS and CMS collaborations are currently embroiled in a fierce battle over the priority of the discovery. This is quite a delicate matter, since the CMS was the first to register a chargino, while ATLAS was the first to correctly interpret it. I believe CERN is refraining from an official announcement of the discovery until the dispute is settled. But we should expect the confirmation anytime soon... stay tuned! This post is an April Fools' joke. 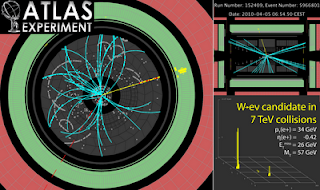 This was obvious to everyone, of course, because there is no supersymmetry in Nature :-) The displayed events feature ordinary muons; these and more are available at ATLAS and CMS public pages.